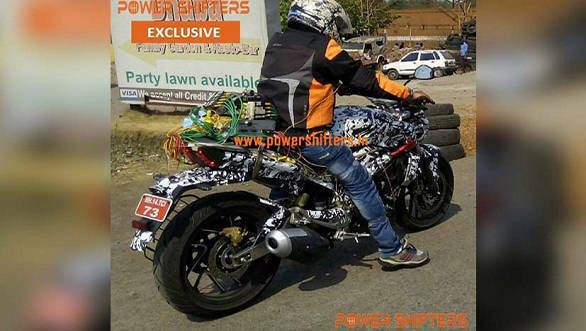 The Bajaj CS400 test mule has been snapped testing. The bike was laden with what looks like an electronic data logger, strapped to the rear seat, with a web of wires running all around it. The body panels are camouflaged, as expected, but on close inspection, it looks like they may be similar to the concept that was showcased at the 2014 Auto Expo in Delhi. The stubby exhaust can and the muffler tip along with the alloy wheels look similar to the expo model too. 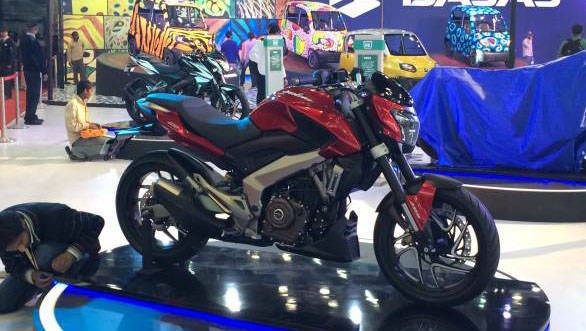 The CS400's engine will be based on the KTM 390 Duke's engine, but expect Bajaj to alter its characteristics. The all-digital instrument cluster is placed above the headlamp cowl, whereas there's a digital read-out for the speed and selected gear on the tank, just like cruiser. It remains to be seen if the speedo falls in the line of sight of the rider. The tail lamps consist of two LED strips below which extends a plastic mudguard with integrated LED indicators, a la the KTM Duke. The CS400 will sport front and rear disc brakes with dual-channel ABS. Unlike the concept bike, the test mule has a conventional right side up fork upfront and a gas-charged monoshock at the rear. Bajaj may have skipped the USD forks to keep costs in check. When launched, the CS400 will be the most powerful Bajaj. The company may launch the bike towards the festive season in 2016. Watch this space for a detailed road test and a video review of the CS400. Kia Soul EV | Walkaround..
Special feature: Escape with the Jeep Compass Limited Plus | Rajasthan..
Mahindra XUV300 v Maruti Suzuki Vitara Brezza, Tata Nexon & Ford EcoSport..
Hyundai Venue Compact SUV unveiled in India - First Look..
Hyundai Venue: How does it stack up against the competition? 2019 New York International Auto Show: 2020 Hyundai Sonata unveiled - India bound?